The 12 hours are designed to be run for 3 hours per day over 4 consecutive days. Although some modifications may be made, these prolonged sessions are critical to fostering communication and trust between the admissions consultant and the student. For more information, or to sign up, please click here. The cost for this program is $1,875. This is a great way to get a head start on senior year! Everyone looks forward to relaxing in the summer – but there are some things that shouldn’t be left to flutter around in the summer breezes. What are we talking about? Test prep! Join us on Saturday, May 31st and hear from our senior test prep instructor, Errolynn Zetar, on why summer is a great time for test prep. She’ll share some tips, answer questions, and tell you about different summer options that are available. Space is limited so please let us know if you’ll be attending. To RSVP, send an email to may@allinoneacademics.com or call 713.405.1193. We hope to see you there! 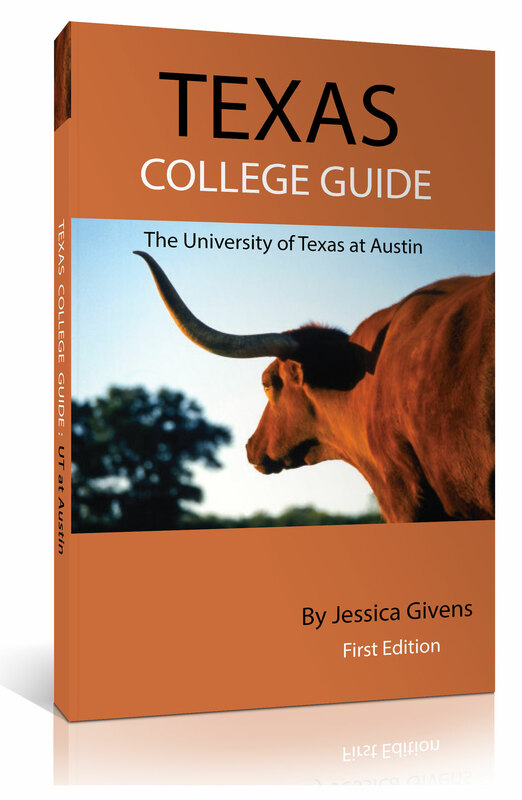 Texas College Guide: The University of Texas at Austin – Now Available! We hope that students (and their parents) enjoy this book and feel informed about the admission process at UT. And if you are a prospective Aggie: don’t worry, this book is the first in what will be a series! Click here to read more about the book on our website. Thanks to all of the parents who shared their experiences! And if you’re interested in learning more about the courses or enrolling for this summer, click here. But hurry! There are only a handful of spots left. We hope everyone is enjoying this fantastic Spring weather – but we all know the truth: summer will be here soon. Before you get swallowed up in end of the school year activities and summer vacation planning – join us for a free college admissions information session! On Saturday, May 3rd, our president, Jessica Givens, will be delivering her engaging and informative presentation “Five Secrets to College Admissions Gold” at our office on West Gray. Too many parents, students and counselors are operating with out-dated assumptions about what works and are blind-sided by often-avoidable rejection letters. Join us to learn about how to navigate the ever-changing college admissions process. This session is geared toward parents of students between eighth and eleventh grade but anyone is welcome. We have had a great response to this presentation in years past – please join us! The information session will also include a brief discussion about our upcoming College Application Crash Courses for high school juniors. Space is limited so please let us know if you’ll be attending. To RSVP, send an email to may@allinoneacademics.com or call 713.405.1193. We hope to see you there! Interested? Then get a move on! Spots are filling up quickly. Click here to read more about what happens in class or to enroll. 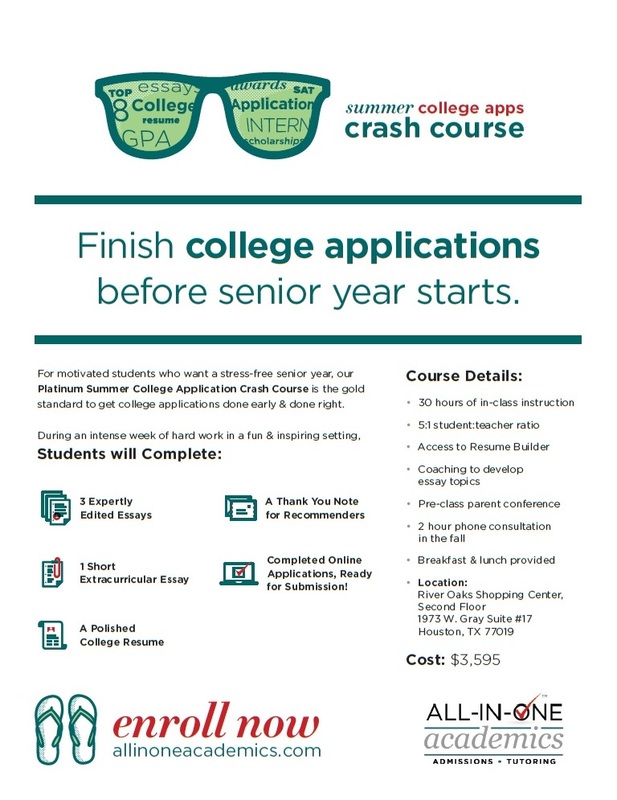 This is a fantastic way to get a huge head start on your applications leading to a significantly less stressful senior year for you and your entire family! Plus, it’s fun! Thanks so much for having Jessica on the show again – it is always a good time! Cool Opportunity: Gap Year Fair at Episcopal HS! We wanted to share some information about a cool opportunity coming up at Episcopal High School on February 24th: the HoustonGap Year Fair. This event is open to anyone in the Houston area and is a great way to get more information about different programs, what to expect, and how to tell who might be a good fit to take a gap year. Some students just aren’t ready to head straight to college and a structured gap year can help them to mature, gain additional experience, and start college on the right foot a year later. *Speaker at 6 p.m in Anderson Lecture Hall. A Gap Year is a period of time between completing high school and beginning college when a student steps outside the traditional classroom experience. This is a time to explore the world, reflect on personal values and goals, and prepare to take the next step in life. If you’re considering a gap year or just a little curious, we hope you’ll attend!